Regular reader Gina Arlen contributes this World’s Tallest Water Sphere sighting. “As you can see from my December 2012 trip to New Jersey, the WTWS survived Hurricane Sandy, Election Season, and the Mayan Apocalypse.” This photo was taken on 2012/12/27. Indeed, the WTWS survives another tumultuous year. How true that the mighty WTWS can survive a hurricane and yet still provide clean fresh water. An alternative scenario in which the hurricane blows over the WTWS would be a calamity. Residents would have to import water in plastic bottles or even drink from the Kawameeh swamp. Next they would be wearing fur skins, eating raw corn, and hunted down by gorillas on horseback. 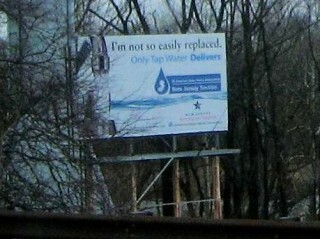 As stated on the new billboard, “I’m not so easily replaced. Only Tap Water Delivers.” The graphic on the billboard shows an outline of the state of New Jersey suspended in a drop of water. This image is evocative of the master/slave relationship between the WTWS and the residents of New Jersey. The WTWS controls the water supply and the residents are compelled to do the bidding of the WTWS. The benevolent tower is our leader and protector. This entry was posted on Monday, December 31st, 2012 at 11:00 am	and is filed under Experiences, Photos. You can follow any responses to this entry through the RSS 2.0 feed. Both comments and pings are currently closed.